On 24 September 2016 Wild Bunch Weddings had the absolute pleasure of heading to the beautiful country side of Gunyarra to film Rhianna and Zach’s wedding day. We started with the boys who were busy setting up the amazing reception shed on the family farm. It was time to put down the tools and start getting ready for the big day. Zach was given some very special gifts, some beautiful memories of his mother a hanky and some beautiful cufflinks. After a good swim to wash off the hard labour the boy’s were now ready and it was time for us to head over to the girls. Rhianna was cool calm and collective with everything running on time. Her amazing hairdresser Shear Pleasure who Rianna also works for was busy making the girls beautiful. Rhianna’s make up was being done by Ashley Digby and Selena Clancy. With the girls being ready it was time for them to hop into their dresses. The bridesmaids dresses were by White Runway. Rhianna stepped into her beautiful Grace Loves lace dress and wow what a princess. It was time for them all to head to Mt Hector where their beautiful Ceremony was to be held. 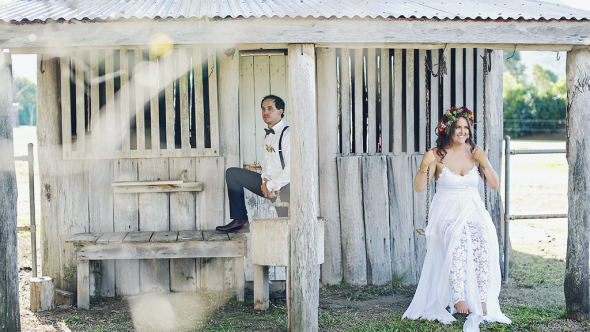 With hills and farms as their backdrop and beautiful decorations by Beautiful Weddings Whitsundays. Rianna made her way down the isle in the arms of her mum and dad to Zach. In a touching ceremony lead by Margaret Roberts they sealed the deal with a kiss and become Mr and Mrs Read. With a giant cheer from their family and friends and some family pictures with Summer Rain Photography it was time to head off on their photoshoot. 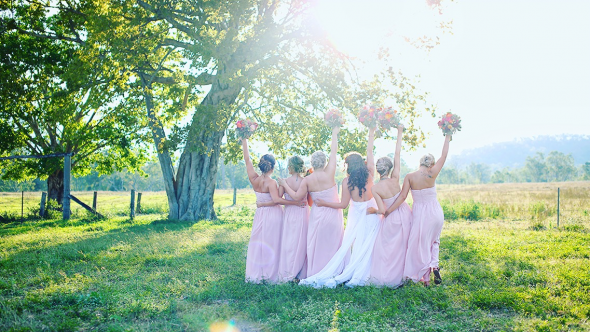 With rolling hills and padocks galore we had some fun with the bridal party and created some special memories of their day for Rianna and Zach. With the sun setting over the hills it was time to make our way back to the shed that held the nights celebrations. What a sight how a old machinery shed could be turned into something so amazing is just beyond us. 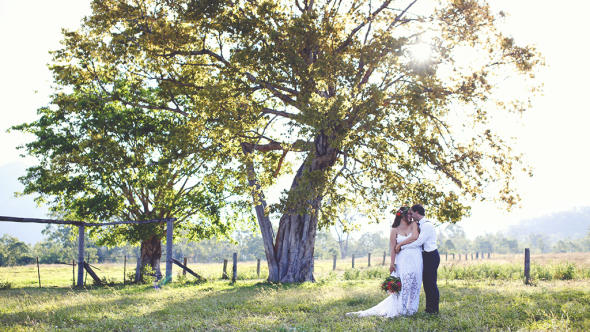 From Beautiful Weddings Whitsundays to many family and friends help their stunning reception was out of this world. With a grand entry from Mr and Mrs Read it was time for the nights celebrations to begin! Congratulations again Rianna and Zach and thank you for choosing Wild Bunch Weddings to film your special day. We wish you both a life time of happiness! Copyright © 2019 Wild Bunch Weddings BLOG . Powered by WordPress and ThemeGrill.